After real nice weather last week, colder, wetter weather has returned. But it was a surprise last night upon leaving “the office” downtown around midnight to see SNOW. And boy was it snowing. And such big flakes! It wasn’t sticking downtown, but when I got to the top of Sewallcrest it was, and the snow was coming down good. I was hoping and expecting to wake up this morning with snow on the ground. No such luck. Just damp ground and damp air. But leaving the house around 11:30am it started snowing again, and snowing good. Then the URBAN ADVENTURE LEAGUE SNOW ACTION PLAN went into effect! I knew that even though the snow wasn’t sticking down in the flatlands, it should be in the higher elevations. The first place I decided to check out was Mount Tabor Park, the highest point in SE (elevation around 650 feet). I hopped on the #15-Belmont bus from SE 30th and got off at its highest point, SE 69th and Belmont. Sure enough, there was snow on the ground up here, the elevation around 500 feet. I walked up the big steps to the summit of Tabor, revelling in the rare whiteness all around. There was a good covering on the hill, though not too much. At most there was maybe a couple inches, and some spots under trees had no snow at all. That didn’t stop a couple from trying to make a snowman, though. And I was definitely excited to see someone bike up the hill! 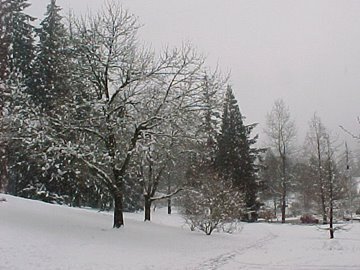 I knew if there was a little snow at Mount Tabor, there could be much more in the West Hills, with elevations up to 1000 feet. I got back on the #15 and transferred to the MAX, and then got off at the Washington Park MAX Stop. When I got off the elevator, I was greeted with several inches of snow! It was winter in the West Hills! The most bizarre sight was found at the Hoyt Arboretum visitor center, where there were a couple of sad looking palm trees covered in snow. Not the climate for them. But all the Douglas Firs, Norway Spruces, and Redwoods looked good with the white powder. I hiked the Redwood, Creek, and Spruce trails, taking in the altered landscape and the quiet hush of a snow covered world. The Creek trail was particularly beautiful, but then I hit an impasse. The bamboo don’t really do good with snow on their leaves, so they were all bent over on the trail, blocking me from going further. The further downhill I went, the slushier the snow got, so I turned round and went back to the top. I was up there for a couple hours until I had my fill. I got back onto the MAX, and when the train got back down into the lowlands, it was a little sunny and no snow to be found. What a drastic transition!